14 August 2017 | Joe D'angelo and Julia Ling, Citrine Informatics. 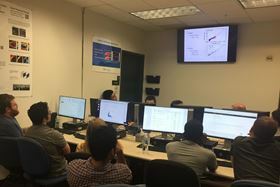 Students at the Texas A&M Summer School on Computational Materials Science built machine learning models based on the shape memory alloys datasets on Citrination. Journal papers contain a wealth of scientific data. With the rise of data science and machine learning, these data are more valuable than ever. Journal papers contain a wealth of scientific data. With the rise of data science and machine learning, these data are more valuable than ever. However, these data can often be difficult to access if they are not published in an extractable format or if they are published across several journal articles. The problem with access to this data makes it difficult to pull the data together in one place to gain insights, visualize trends, and build data-driven models. Recently, Citrine Informatics partnered with Elsevier and Acta Materialia Inc. to curate the results from seven data-rich journal papers on the topic of shape memory alloys. Shape memory alloys are a class of metals that can “remember’’ their original shape, and will return to that shape when heated. These alloys have numerous applications, such as solid state actuation. The discovery of new shape memory alloy compositions is an area of active research. Data-driven methods have the potential to vastly accelerate this materials design problem, if the currently available data can be harnessed. The seven papers included in this project are currently available on ScienceDirect, and their associated curated datasets are publicly available on the Open Citrination platform at citrination.com. These datasets can now be utilized as the basis of machine learning models to predict properties for novel compositions and guide the search for new shape memory alloys. Dezhen Xue, Deqing Xue, Ruihao Yuan, Yumei Zhou, Prasanna V. Balachandran, Xiangdong Ding, Jun Sun, Turab Lookman, “An informatics approach to transformation temperatures of NiTi-based shape memory alloys”, Acta Materialia, Volume 125, 2017, Pages 532-541, https://doi.org/10.1016/j.actamat.2016.12.009. Read the article for free, here. J. Frenzel, A. Wieczorek, I. Opahle, B. Maaß, R. Drautz, G. Eggeler, “On the effect of alloy composition on martensite start temperatures and latent heats in Ni–Ti-based shape memory alloys”, Acta Materialia, Volume 90, 2015, Pages 213-231, , http://dx.doi.org/10.1016/j.actamat.2015.02.029. Hee Young Kim, Takafumi Jinguu, Tae-hyun Nam, Shuichi Miyazaki, “Cold workability and shape memory properties of novel Ti–Ni–Hf–Nb high-temperature shape memory alloys”, Scripta Materialia, Volume 65, Issue 9, 2011, http://dx.doi.org/10.1016/j.scriptamat.2011.07.049. Shuiyuan Yang, Yong Liu, Cuiping Wang, Xingjun Liu, “Martensite stabilization and thermal cycling stability of two-phase NiMnGa-based high-temperature shape memory alloys”, Acta Materialia, Volume 60, Issue 10, 2012, Pages 4255-4267, http://dx.doi.org/10.1016/j.actamat.2012.04.029. Yahya Motemani, Patrick J. McCluskey, Chunwang Zhao, Ming J. Tan, Joost J. Vlassak, “Analysis of Ti–Ni–Hf shape memory alloys by combinatorial nanocalorimetry”, Acta Materialia, Volume 59, Issue 20, 2011, Pages 7602-7614, http://dx.doi.org/10.1016/j.actamat.2011.08.026. Enric Stern-Taulats, Antoni Planes, Pol Lloveras, Maria Barrio, Josep-Lluís Tamarit, Sabyasachi Pramanick, Subham Majumdar, Suheyla Yüce, Baris Emre, Carlos Frontera, Lluís Mañosa, “Tailoring barocaloric and magnetocaloric properties in low-hysteresis magnetic shape memory alloys”, Acta Materialia, Volume 96, 2015, Pages 324-332. http://dx.doi.org/10.1016/j.actamat.2015.06.026. There are many options for authors to share their research data and link them to their publications. Elsevier and Citrine Informatics have been partnering on a data linking initiative since the beginning of 2016 – authors can deposit their data in the Citrine Informatics free public platform at citrination.com and the dataset will be automatically linked back to the research paper. To find out more about Research Data at Elsevier, please visit: https://www.elsevier.com/authors/author-services/research-data.